Something Human, in partnership with Brockspace, are pleased to present a series of live performance works entitled FRESHLY PACKED / ALWAYS CHECK THE LABEL. This line-up of work will take place across the summer of 2013 and aims to bring new, experimental work and build new audiences for live performance work in Brockley, southeast London and beyond. These original live performance works explore themes surrounding notions of the biological, corporeal, flesh, food, sustenance and mortality. What is flesh? Should we eat it? What happens to flesh when it is transformed? To kick things off, we are excited to welcome artist, Anya Liftig, from Brooklyn, NYC, who will perform her work, Consider the Lobster at Deptford Market, 11 May 2013, 11.30am. In this performance, Liftig obtains a fresh lobster from Codfathers and elongates the act of cooking the lobster for dinner. Taking her cue from David Foster Wallace's noted essay of the same title, the artist silently communicates with the lobster before revealing a cooking pot and begins to cook it for dinner. 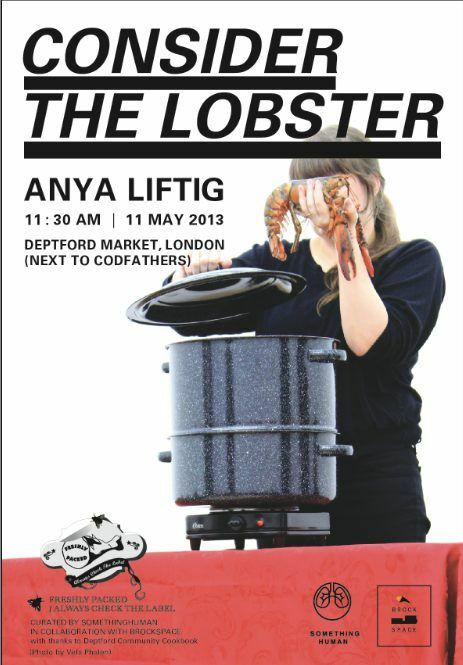 This performance is made possible with thanks to the Deptford Community Cookbook. Then over 11-13 May, look out for interventions from Liftig at the galleries and museums in London, for her series, All the Animals in the British Museum! Please check www.something-human.org for more information regarding how to sign up a live performance for Freshly Packed and to find out about other performances over the summer.